When it became time to brainstorm on final ideas, I struggled with deciding what exactly I wanted to focus on. From the beginning of the semester, I carried this idea of creating an interactive and tangible newspaper - where the user could press buttons within the newspaper article and hear the words relation to the picture and literature. The idea didn’t stick but did come around, eventually. After having gone through the depressing election and seeing how much of an effect Donald Trump has had on the American society, I decided to rethink my idea. I looked deeper into the tactics of Donald Trump and the characteristics of the American society, an I found so many similarities. I then decided that I would focus on creating some type of interactive mirror, symbolizing how Trump is simply a reflection of our society and that’s why he (actually, not very surprisingly) was able to get elected. In one of our last few classes, Ben mentioned that our projects should not just be a fulfillment to the class’ requirements, but something that would actually mean something to us. That was a huge turning point for me, within my project. I felt uninspired with the mirror, and realized that it was because devoting any more energy to Donald Trump was becoming too mentally and emotionally exhausting. 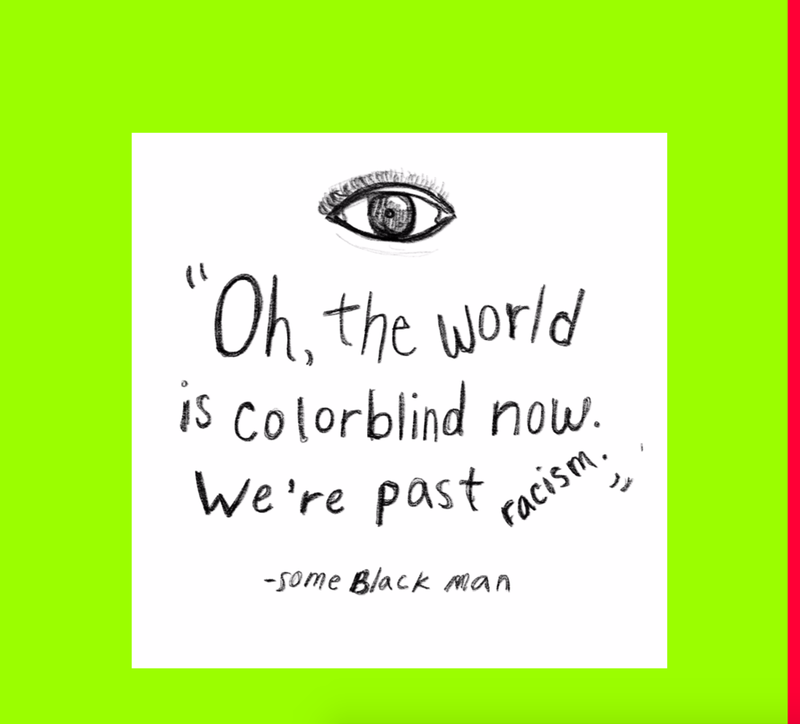 So, I decided to actually focus on something that has meant a lot to me and on issues that I have been thinking of very frequently - systematic racism and an alternative reality where the racism did not work so much against me and everyone that looked like me. Blacktopia was then formed. When enrolling in this class, I initially thought the social problems other than the election, would be discussed. I wanted to go back to that initial idea of the course as I created this project - thus, allowing me to hack in to the contemporary political rhetoric of the American society through everything from beauty standards to dog-whistling racist political rhetoric code to systematic racism, and so on. I was able to use the tendencies of American politics, that I learned while in this course, in my project. 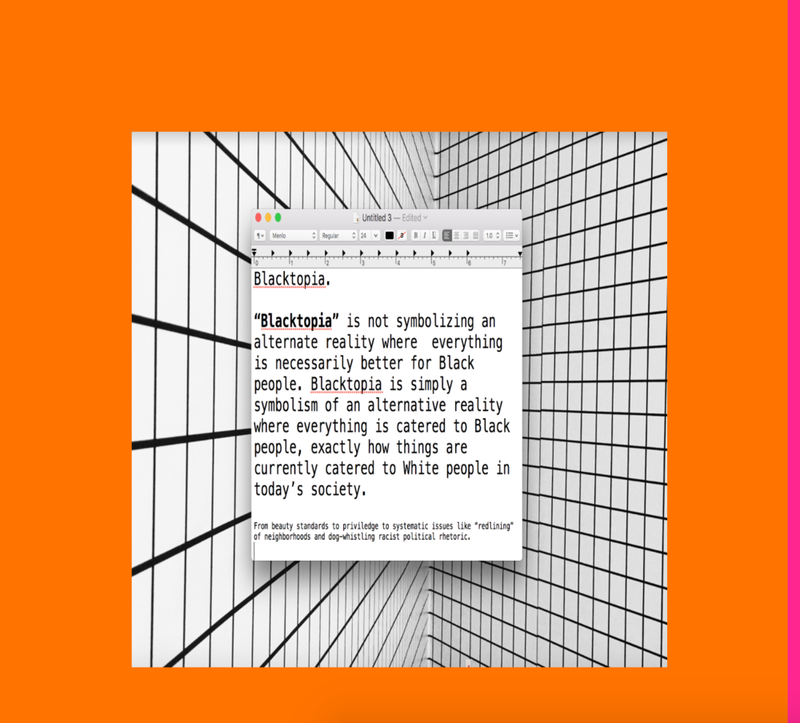 From this course, I have become even more aware of systematic issues and double standards, and I was excited to explore those ideas within my project, Blacktopia. 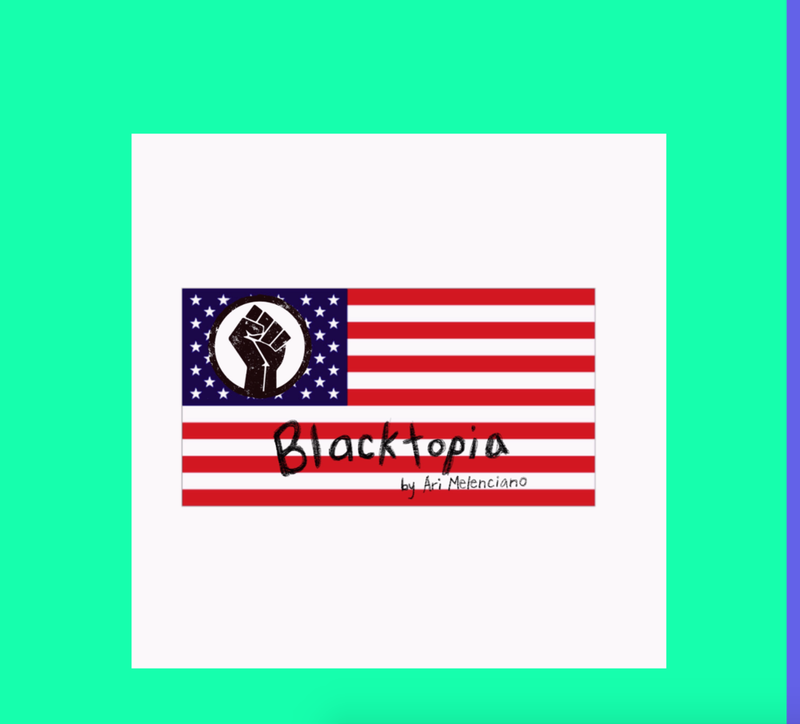 You can experience Blacktopia with this link. In this supercut, I used a supercut of Apple and their consistently super positive adjectives of their products with Trump's consistently super negative adjectives of America. I wanted to contrast their approach to gaining appeal and the tone that their rhetoric creates. Apple is an incredible company. They hold great passion within their products, and highly value their marketing strategies to not only make their product a positive experience - but also their deliverance of their products. Donald Trump is universally conceived as a bully that uses a high level of scare tactics in his campaign. He uses incredibly negative rhetoric in so many of his speeches. And the experience, when watching Trump, is one focused on the creation of fear and intimidation. I thought it would be very interesting to contrast the two very different tactics between Apple and Donald Trump. For my midterm video, I decided to focus on a handful of ideas - the campaign coverage (as a whole) between Clinton and Trump, how the media approaches both of these candidates, how these candidates have been received from audiences of different ages, the societal issues that Trump has brought to surface through his disgusting character and how he reflects part of America's indecency. I scoured the internet, for hours, looking for footage that related to one another and tied them all together to create a short documentary. 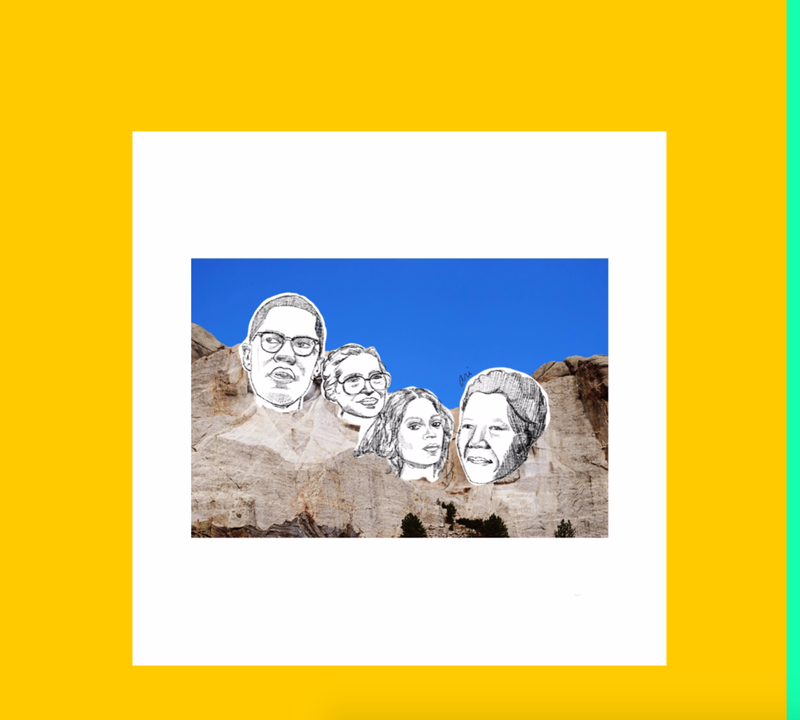 I've noticed how big of a part pop culture has played in this campaign and continued the pop culture lens theme from my last few projects by using more pop culture-based sources (like Ellen and SNL). In editing this video, I started off comical and playful with what has been going on. Further into the video, the audience would then find the progression of ludicracy within the Trump campaign and how the inappropriate behavior can also be observed in the American culture. It then ends with the note of how through this election, the indecency is losing is shock value and taking away from the truth; taking away from the pure havoc that is being exemplified. A lot has been happening this year, in politics, and a lot of new media technologies have been developed - making watching this year's political debate exceptionally exciting. For class, we'll be using Popcorn as we watch the political debate, all live. With the ability to edit/"remix" video immediately after it has been on air, while millions of people are watching, while accessing those millions of people via the internet, and having access to the Internet Archive - the possibilities become almost endless. Making an animation that shows Clinton and Trump in a "boxing match" and allowing people to vote in whether they believe Hilary or Trump "won that point." People could vote by using a hashtag or clicking a button on a quick page that I develop, or texting in. This then plays off how many gather to watch boxing matches, and making the debate more entertaining. To make the debate silly, and more entertaining - an idea that I had was to just track how many times they've said a certain word. Trump makes a lot of silly facial expressions. This idea includes zooming in on the different expressions that Trump makes and making a gallery of it all at the end of the debate. I plan on doing more research on actual issues that they would be addressing, and creating more academic uses of Popcorn, as well. In playing around with various videos and selected word phrases, I came across a video with that had political candidates saying "question," very often. After listening to the generated supercut that VideoGrep created when selecting "questions" as the keyword, I immediately thought of Destiny Child's song, Independent Women. I then found a keyword that had a political candidate saying something similar to "about a week ago." "About a week ago," became a popular phrase after Bob Shmurda used it in his song (excuse the profanity in the title - I didn't know that was name of the song until looking up the phrase). Thus creating, "Donald Trump Becomes an Independent Woman About a Week Ago."